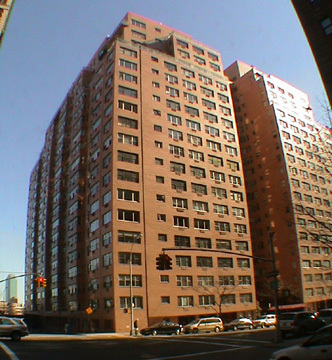 One of two nearly identical apartment towers on the east blockfront of Sutton Place South between 54th and 55th Street, Cannon Point North was built in 1959 and converted to a cooperative in 1973. This building has a warm orange-pink brick facade in contrast to the white-brick facade of Cannon Point South, just to the south. This building also has a one-story, red, polished granite base flanking its recessed, landscaped and canopied entrance. Its rather unusually colored facade has held up well over the years and while not as rich as red it is not as garish as one might have thought originally. The 320-unit, 21-story building, which is cantilevered over the FDR Drive, is one story taller and has 43 apartments more than Cannon Point South.